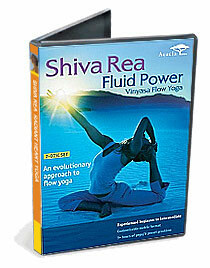 Explore the power of your fluid nature with Shiva Rea, one of the yoga world’s most inspiring teachers. Her innovative sequences move with natural flow for a completely original style of yoga that enhances vitality, agility, and creativity. Through rhythmic, circular, and spiraling movements, you will learn to liberate poses that are often rigidly held, allowing you to grow stronger and more flexible with grace. The unique Yoga Matrix menu allows you to customize your practice, choosing from over 3 hours of yoga (20 segments) to suit your time and energy level on any given day. We are naturally fluid. More than half our total body weight is water. And yet this fluid power—in our awareness and way of moving—is often an untapped reservoir of energy and joy. Explore the power of your fluid nature with Shiva Rea, one of the yoga world’s most inspiring teachers. Her innovative sequences move with natural flow for a completely original style of yoga that enhances vitality, agility, and creativity. Through rhythmic, circular, and spiraling movements, you will learn to liberate poses that are often rigidly held, allowing you to grow stronger and more flexible with grace. The unique Yoga Matrix menu allows you to customize your practice, choosing from over 3 hours of yoga (20 segments) to suit your time and energy level on any given day. Or, choose one of 6 pre-set practices, from foundation to advanced, from short to long, from solely meditative to energetic. Sequences include four innovative sun salutations, water "core," standing pose mandala, fluid backbends, handstand, forward bends, pranayama, meditations, and deep relaxation. For experienced beginners to intermediate practitioners.